MANILA, Philippines – The Gilas Pilipinas Men’s National Basketball Team aims for gold in the 1st MVP Cup and last phase of their training before heading to Hunan China for the FIBA Asia Olympic Qualifiers. Coach Tab Baldwin and the rest of the boys will be facing familiar teams in this pocket tournament: Wellington Saints of New Zealand, Chinese Taipei Team A whom they both beat in William Jones Cup a week ago and Talk ‘N Text Tropang Texters who replaced Team Lebanon after backing out and almost derailed the inaugural tournament. Gilas Pilipinas stretched their winning streak from Taipei by clobbering MVP owned team Talk “N Text with a depleted line-up to the tune of 93-77 at the Smart Araneta Coliseum in Cubao, Quezon City. The Tropang Texters bannered their first and second drafts picks Moala Tautuaa and Troy Rosario who can possibly match San Miguel Beermen’s 6’10” behemoth Junmar “The Kraken” Fajardo and other PBA front liners. Rookie Moala Tautuaa scored the first basket of the game after grabbing Andray Blatche’s missed 3-pointer, brought it down from coast to coast and finished with an easy layup. On the other side of the court, Jason Castro, Gilas’ first-stringer point guard placed his team on the score board with a slash and drive. Castro seemed too comfortable playing his team mates and scored another 6 points for a total of 8 with more than 5 minutes remaining in the opening salvo. Tautuua who played as Gilas’ back-up Naturalized Player in Taiwan, sent a direct message to all PBA teams by rocking the whole backboard with a thunderous double-handed jam. The 23 year old - 6’7” forward-center showed that he came in the PBA to revolutionize the game style of all bigmen. The long-bearded giant relentlessly sprinted the court and show his decent jump shots. Gilas ended the first quarter with a half-shot lead 23-22. Talk ‘N Text’s off-season training in South Korea has somehow paid off as they managed to contain the Nationals’ explosiveness. Along with Tautuaa, Ryan Reyes and former Gilas gunner Larry Fonacier combined great efforts to close the scoring gap in the opening period at least. The boys in national colors had found their rhythm in the second quarter as they posted their first ever double-digit lead 32-22 courtesy of Ranidel de Ocampo and newcomer Terrence Romeo. But ex-Gilas Larry Fonacier was too quick to react as he showed his former team what they are going to miss: his flawless threes. The once 10-point lead has been reduced to just 2. Coach Tab Baldwin admitted that time is of the essence for Andray Blatche to get in shape with two more weeks remaining before the prestigious tournament. 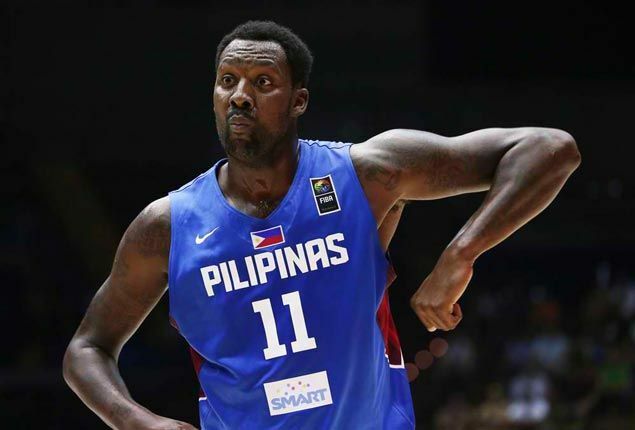 Baldwin is not hoping that Blatche will be in perfect shape like the way he was two years ago but still optimistic that his prized center will get closer to his former physique. After 2 quarters, Blatche had just recorded 4 points and was seen catching his breath heavily on the floor. But despite of his slow start, business as usual for his company as they headed to the dugout with 5-point, 45-40 lead. Gilas seniors started the penultimate quarter with Asi Taulava having fun under the rim against his successor, fellow Fil-Tongan Moala Tautuua and long-time pal Harvey Carey. Andray Blatche had finally found his tempo and recorded his first two-digit markers as expected. Blatche helped his team brought back their huge margin 69-52 after the quarter number 3. Gilas reserve Troy Rosario opened the final chapter of the ball game with a deep three from the right side. Rosario was one of the 16 players who competed in Jones Cup but got cut from the official Gilas Roster couple of days ago. But the former NU Bull was designated to the reserve list along with gunner Gary David. Lone San Miguel group player Marc Pingris, made his first basket off a steal and fast break layup converted. With Pingris’ bucket, acting TNT Coach Nash Racela was forced to call a timeout after seeing his team downed by 18 points. Larry Fonacier was still waxing hot from the outside as he drained two consecutive long bombs plus Big Mo’s layup and one to trim the lead 83-72 with 3 more minutes remaining in the game clock. Terrence Romeo stepped-up the gas pedal added more points before the final horn sounded. Matt Ganuelas-Rosser ended the game with a tomahawk dunk from the middle posterizing another known dunker Moala Tautuua. Terrence Romeo once again wowed the crowd with 22 points and 5 assists to win the Best Player of the Game award.